Will new bill cost homeowners more? Will new bill cost homeowners more? Joe Ducey breaks it down. PHOENIX — In February, Let Joe Know reported that Arizona Senator David Farnsworth (R-Mesa) asked his fellow Senate Government Committee members to trust him to make changes to Senate Bill 1531--a bill many were wary of voting for. Well, they did. Now, the bill is being considered by the House. Homeowner advocate Dennis Legere says if passed late payments will still be applied to assessments first, and management companies would now have to send a certified letter 30 days before a delinquent account could go to collections. Legere said most of the changes benefit management companies. "The bill adds other provisions that will cost every single homeowner more money for no valid reasons," he says. 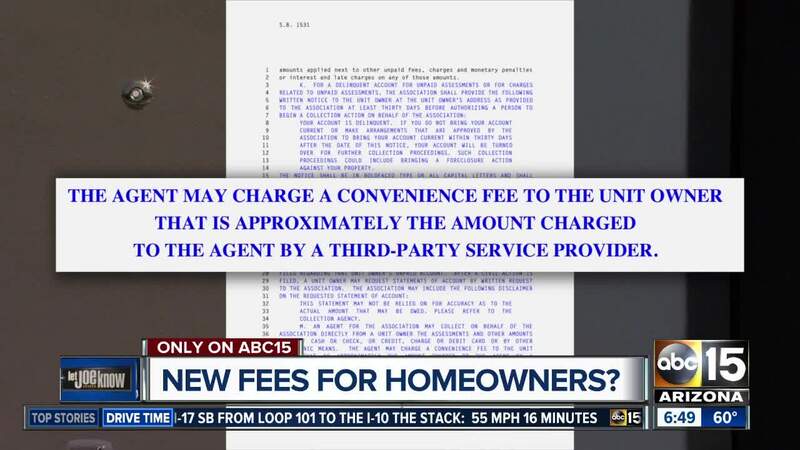 Legere with Arizona Homeowners Coalition, says homeowners in all 5,500 professionally managed HOAs throughout the state would be on the hook for at least two new fees. He points to a provision that gets rid of the payment books, and mandates paper statements to every single homeowner before every single due date. While it might sound good on its face, Legere says by law, homeowners can get that right now for 15 cents per page. Many companies have access to accounts online for free. Legere fears the law would significantly increase the cost and "allow the management companies to charge the association whatever they want for this service because it's mandated by law the association has no choice to either reject or refuse." Another concern is a proposed mandated convenience fee for payment other than cash or check. Legere says management companies are already free to negotiate that price in contracts with associations right now. "There's nothing that stops them from doing it," he says. As written, Legere says management companies would also be allowed to charge homeowners "approximately" what the fee cost them. Could be less, but he fears it would be more. "This is nothing more than a mandated government subsidy of the management companies by this bill," he says. We asked management company lobbyists Arizona Association of Community Managers and Community Association Institute for comment. Both declined citing the bill not being assigned to a committee in the House. Let your legislator know what you think. You can find them here.